What Will Turkey’s Future Be Like? Turkey marked its 94th anniversary in October, celebrating that anniversary with serious problems related to its latest strategic choice in foreign affairs. For an extended period in its history, Turkey’s politics were connected with its main geostrategic asset, the Bosphorus and Dardanelles Straits between the Mediterranean and Black Seas, which were the object of numerous military conflicts over several centuries. The main reason for these conflicts was that both straits were, on the one hand the key to Russia’s access to southern seas, and on the other, a wonderful opportunity for the West’s naval aspirations on Russia’s south. This is where Turkey’s constant balancing between territorial ambitions toward Russia’s south, and the desire to use the military potential of its northern neighbor for opposition to the West is originated. Though Turkey had been, on multiple occasions, a military and political ally of the West, however temporarily, as history witnessed throughout the last centuries – until such “alliance” served the West’s main goals and interests. After the end of the World War I, British, French, and Greek armed forces occupied the Bosphorus and Dardanelles Straits, as well as Istanbul, which was the capital of the defeated Turkish Empire under the rule of Ottoman dynasty. In 1921, in Moscow, the Soviet-Turkish “Treaty of Brotherhood” was signed, which became the first official recognition by Russia of Turkey’s independence and equality, and its struggle against the Anglo-Greek intervention. Although Turkey fought for independence against Western occupation forces, and received support from Soviet Russia’s government, as soon as the World War I ended, the Turkish leader Mustafa Kemal Atatürk tried to establish good relations with France, Great Britain, Greece, Italy, and with rising power of that times, the United States of America. In 1947, after the end of the World War II (during which Turkey remained neutral), the American President, Harry S. Truman, announced a “new policy,” in which Turkey and Greece were considered to “belong to the Western system.” Then, in 1950, Turkey sent troops to the Korean War and in 1952 became a member of the NATO. In addition, Ankara also joined the Council of Europe and the Organization for Economic Co-operation and Development, the OECD, enthusiastically engaging in integration with the European Economic Community, which over time transformed into the European Union. From the above-mentioned 50’s of the previous century, which marked the height of the Cold War and the intensification of confrontation between NATO countries and Soviet Russia, the strategic value of Turkey for the West acquired special importance in connection of which the United States and European powers tried mightily to draw Turkey into the “Western system,” to maintain strong ties with Ankara at any cost despite serious differences. Recently, while confronting serious problems in relations with its main political ally, the United States of America, and its main economic partner, the European Union, the ruling Justice and Development Party, headed by President Recep Tayyip Erdoğan, has strived for closer cooperation with Turkey’s traditional rivals in the region, Russia and Iran. At the same time, the Party continues to have problems with a number of Arab countries, though in domestic policy it relies on the votes of conservative Islamists. Washington, in turn, is dissatisfied that the Turks are pursuing their own line in Syria, agreeing on a number of issues with Russia and Iran. And recently the US took an openly anti-Turkish step by suspending the issuance of nonimmigrant visas, having decided to “minimize the number of visitors to the Embassy.” Previously, the United States expressed dissatisfaction with Ankara’s purchase of an S-400 anti-aircraft missile system from Russia, saying that this will create problems for NATO. Recent serious anxiety of the Turkish president is also correlating with decreased trust in NATO. He reminded that during the period of the maximum growth of the terrorist threats from Syrian territory, the North Atlantic Alliance withdrew Patriot anti-aircraft missile systems from Turkey making clear that it would not support Ankara in case of an attack on Turkish territory. An additional round of chilling relations between Turkey and NATO occurred during NATO’s maneuvers in Norway from November 1 to the 18th, when President Recep Tayyipa Erdoğan, and the founder of modern Turkey Mustafa Kemal Atatürk, were depicted on a display as “accomplices of enemies of NATO and its hypothetical enemy.” It was apparent that this scandal had not erupted over a mere oversight. 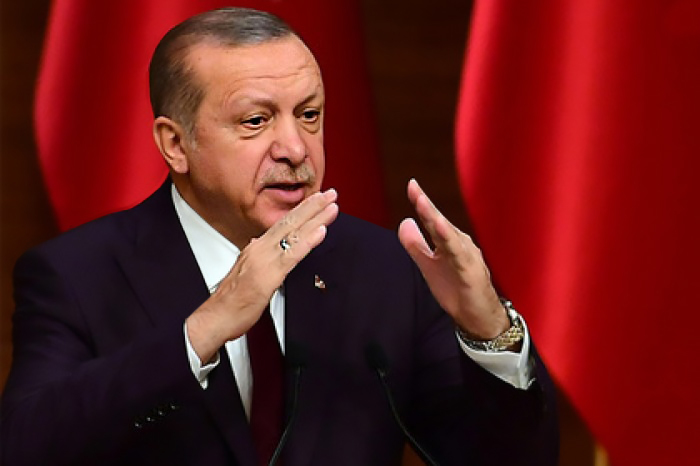 Apparently, it is a clear example of the growth of anti-Turkish attitudes, which Western governments have endorsed for a long time, as in the issue of Turkey’s accession to the EU, and in critical perception of the personality of the country’s leader, Tayyip Erdoğana. Yes, we can assert that today Europeans are creating independent states with a Muslim population (Bosnia and Herzegovina) for the sake of the Turks. However, this will not impede Europe from delicately carving up Turkey itself. Kurds and Armenians will rise, and Europeans will demand from Ankara recognition of the independence and right of these peoples to self-determination. It is entirely possible that they will tell Turkey that, in exchange for previous concessions, she herself must now grant independence to the Kurds and Armenians, in so doing “magnanimously” dividing Turkey into parts. It is under such difficult conditions that Turkey today has been forced to make an alliance with Iran and Russia, which encounters further displeasure from the United States and Western Europe, but which Ankara uses to build “a current balance of power favorable to it.” That is why, against this background, relations between Russia and Turkey cannot be considered a stable factor in Ankara’s future political orientation. Everyone remembers the “stab in the back” with the downed Russian plane, and also the recent promise of Erdoğan to Poroshenko, that Ankara will not recognize Crimea as Russian territory. And, as they pertain to the Syrian question, Ankara’s relations with Moscow and Tehran in no way look rosy, which provides periodically a reminder of the number of disagreements in views on the matter. So one can say that Turkey is not such a far cry from the United States in duplicity, and Ankara can be called a present-day partner of Russia and Iran, without any guarantees for the future. Vladimir Platov, Middle East expert, exclusively for the online magazine “New Eastern Outlook“.